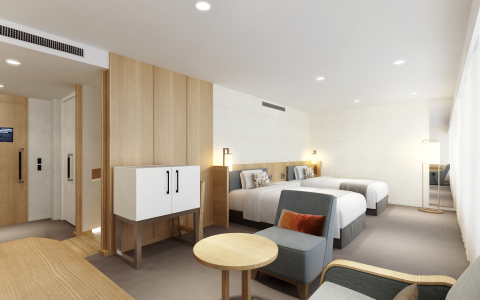 TOKYO--(BUSINESS WIRE)--Keio Plaza Hotel Tokyo (KPH), one of Japan’s most prestigious international hotels located in Shinjuku, Tokyo, will begin renovation of its ten universal design guest rooms (35.5 square meters) on the 30th floor of our Hotel from the middle of July 2018, and add three new luxury type universal design rooms, including two 47.0 square meter and one 67.4 square meter rooms, bringing the total number of universal design rooms to 13 to be reopened in the middle of December 2018. A total of JPY400 million will be spent on the renovation of these 13 universal design rooms and four other general guest rooms, also on the 30th floor, to raise their design and functionality as part of our Hotel’s long track record of industry leading efforts to provide easier access to a wide range of customers. Keio Plaza Hotel Tokyo will spend JPY400 million for renovation of universal design rooms and opening of new luxury type rooms in December, 2018.